Addressing modes are supported by suffixes to the instructions: .IA (increment after), .IB (increment before), .DA (decrement after), and .DB (decrement before). These can only be used with the MOV instructions. The move multiple instruction, MOVM, defines a range of registers using brackets, e.g. [R0-R12]. The special MOVM addressing mode bits W, U, and P are written in the same manner, for example, MOVM.DB.W. A .S suffix allows a MOVM instruction to access user R13 and R14 when in another processor mode. Shifts and rotates in addressing modes are supported by binary operators << (logical left shift), >> (logical right shift), -> (arithmetic right shift), and @> (rotate right); for example R7>>R2or R2@>2. 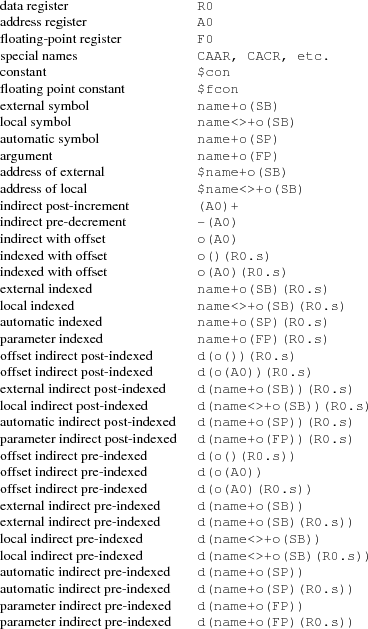 The assembler does not support indexing by a shifted expression; only names can be doubly indexed.